Mix rapper and actor Common, a panel of music industry executives and a crowded room of CSUN students to create an eventful evening. A panel of music industry executives spoke to students about the change in the music industry and offered advice during an event in the Northridge Center in the USU. The panel discussed how technology has impacted the music industry, new trends in music, how to achieve longevity and maintaining individuality. “Music right now is most accessible … the use of technology is at the forefront,” said Max Gousse, senior vice president, A&R of Island Def Jam Music Group. One of the topics the panel discussed was musicians becoming famous through Youtube, iTunes and social networking sites such as Twitter and Facebook. “We use traditional platforms like radio but also media networks to get music out there,” Gousse said. Lynn Jester who produced the event, talked about the way things were done before technology and when print was still the major outlet for the media. “When we did print it was very different. Digital allowed us to do things a lot faster,” she said. Billy Johnson Jr., journalist, new media content producer, author and senior editor for Yahoo Music, gave his insights on the subject and mentioned that it’s important to be involved online with all the new technology. “What we have learned in the past few years is that when a music video launches, people go online…everyone realizes that its important to post things online,” Johnson said. But just because you think that you have “made it” in the music industry does not mean that you will be around forever. In the industry there are many one hit wonders and groups that have hit after hit but then die off after a few years, the panel said. Dense said that it was about individuality and staying true to yourself and just being you that will keep listeners interested. “As long as we see you for who you are and you’re not trying to be me or him or her, then its acceptable,” he said. Individuality is key. There are so many artists out there that have the same sound and this is why many do not last. If you don’t bring anything different to the table, no one is going to care, Dense said. “Your individuality is who you are. With Yahoo and Twitter it’s a lot faster to become popular. Use the tools you have right now to get where you need to be,” he said. Another topic the panel discussed was competition. With artists like Madonna, Britney Spears and Kayne West out there, the industry is very competitive. Musicians have to compete with all these artists who already have a ton of hits and have been in the game for years. However, they said, a musician can’t expect to gain the recognition of a record executive only through Youtube or Facebook. “You gotta get out there are perform. Whether it be in the clubs or on tour opening up for other artists,” Gousse said. 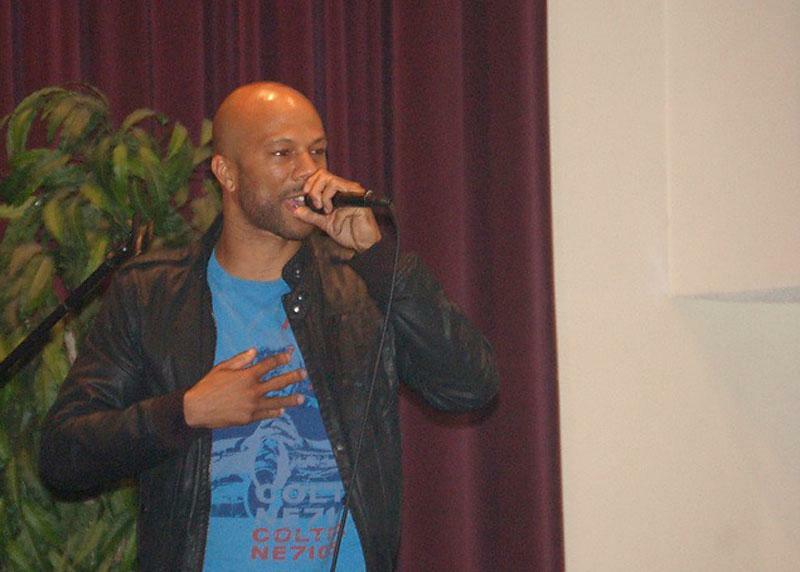 Common even put in his two cents for the audience before the eight students performed their songs. He gave the eight students some advice. “Rapping was something I wanted to do..,we all have a purpose and when we find that something that we love, go for it…I want to encourage everyone in here…if you believe in it, nothing can stop it,” Common said.